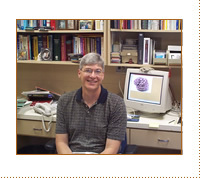 The Neuropsychology and Memory Assessment Laboratory is directed by L. Stephen Miller, Professor of Psychology. The laboratory is quite active and supports neurocognitive research by faculty and graduate students in multiple areas, with an emphasis in normal and pathological aging using both traditional cognitive tools and structural and functional neuroimaging. Additional studies of traumatic brain injury, caregiver/care recipient interactions, and test reliability and validation are also conducted.